2017 has been the best year on record for investment into high-growth British companies, according to a report published this month by Beauhurst, the online platform which tracks the UK’s fastest-growing startups and scaleups. Here, our legal Tech expert, Nicola McNeely, sheds some light on the report's figures. 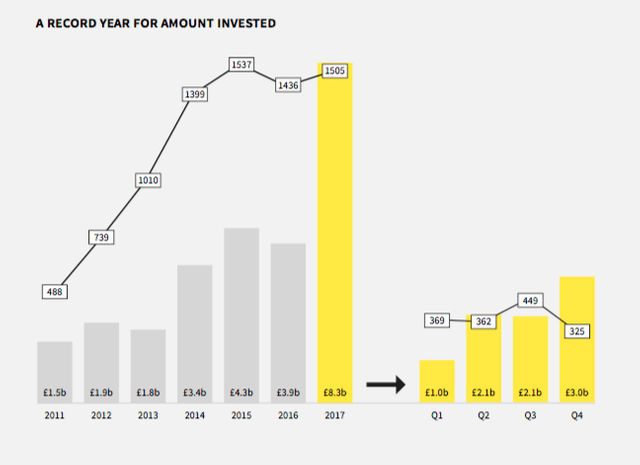 The report shows more than twice the cash has gone into high-growth firms in 2017 than 2016 – with £8.27bn being invested, it's beaten every record since 2011. Last year saw the rise of ‘megadeals’. There were 29 £50m+ deals in the UK in 2017 - that’s four times as many as the previous year, showing there is a lot of cash out there. But, most of these deals are with firms that have already raised millions. The report stated, for the first time, it's seen a fall in the percentage and volume of seed-stage investment. London is still the investment capital of the UK, taking 72% of megadeals, and 51% of total deals. The Fintech sector is stronger than ever, receiving 25% of the overall investment (over £1bn) and the sector grew by 15% in 2017. Challenger banks saw 19 raises in 2017 and £500m of funding. Atom, Monzo and Revolut obtained £113m, £71m and £51m respectively. Although there has been speculation around the stability of these B2C fintech companies, their turnover is steadily increasing and losses dropping, showing these startups are heading in the right direction. Fintech in Britain is going from strength to strength, and we're host to a number of super-startups, with companies like Funding Circle and TransferWise reaching unicorn status. The huge growth in deal numbers and investment in 2017 is promising for the UK, despite the ever-present Brexit uncertainty surrounding Britain. Capital is there for the right opportunity and 2017 proved the UK was an attractive choice for foreign investors, with a huge 369 deals and £5.9bn invested. Click here to seeBeauhurt's full report. This report comes at a critical time as Brexit fears linger and the UK government is negotiating the European divorce terms. The UK has embraced the concept of creating an innovation driven economy. Programs such as the EIS and SEIS act as market driven subsidies for early stage firms. Fintech has emerged as a sector of excellence due to the UK’s leading spot as a financial center. So will the good times continue? Time will tell. As for 2017, Beauhurst says deal numbers have returned to their 2015 peak with investment into venture stage firms increasing nicely. Fintech, according to Beauhurst, experienced its best year ever surpassing £1 billion in funding thus echoing the sentiment shared by the Innovate Finance report.